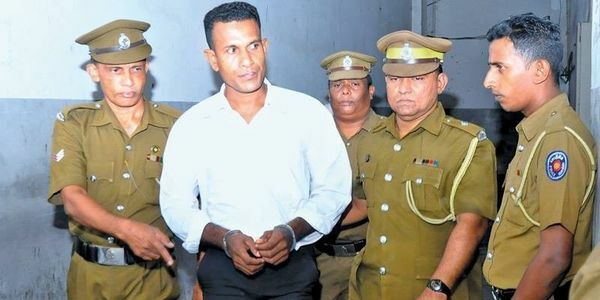 War hero Ratnayaka Mudiyanselage Sunil Ratnayaka is on death row at the age of just 38 for the crime of protecting his country from a 30 year pogrom of ruthless LTTE terror because the present Sri Lankan Government wants to appease the LTTE rump who enjoys much political succor in England, the US and Canada. At the hour of the country’s need, when innocent men, women and children were being massacred by the LTTE, referred to as the ‘most ruthless terrorist organisation in the world’ by the US State Department, we as a country looked up to our young brave soldiers like Sunil to save us! No foreign country came to our aid and no global or local human rights champion cared two hoots about the innocent civilian lives that were being taken by the LTTE. 11.11.95 Colombo LTTE suicide bomber kills 15 children. Then the LTTE started the 1996 year on 31.01.96 with a horrendous attack on the Colombo Central Bank where they killed 90 and injured a further 1,400 people also damaging other buildings in the process. It was a traumatic time for the SL Army unable to retain its soldiers and their morale in the face of unimaginable inhumanity and cruelty and the apparent success of the terror organisation. Sunil, the youngster, came forward to redeem his country from obliteration because he had the back bone, the compassion and the sense of pride which many during that period lacked. Sunil had no need to kill Tamils or any other person when he joined the army. He was never a killer! He came forward to safe guard the innocent from the death grip of the killers, the LTTE. His valour was recognised by the Sri Lankan government itself with an award “Rana Shoora Padakkama awarded by the then President Chandrika Coomaranatunga in 2001. He was awarded the Rana Shoora in appreciation of his valiant efforts which included walking stealthily 20- 30 km into the enemy territory to spy during the fight to liberate Chavakatcheri. It was no picnic for him; it was not a nine to five job in an air-conditioned office in Colombo. Silghtest hesitation meant a horrible death! He was no ‘killer’ then; he is no killer now! We understand that Sunil’s now destitute wife has also written a letter to you, the President, asking for mercy for her husband. She has the sole responsibility for their only child with no answers to give her toddler why her beloved hero of a father is being murdered by the Sri Lankan State! Showing mercy to this heroic soldier who contributed so much to stop the blood flowing in the country will earn you, the President, a place of merit in the annals of Sri Lanka's history! On the contrary, if you allow this soldier be made a scapegoat to appease the Tamil Diaspora and the so-called human rights champions who cared not about the Sri Lankan civilians who were massacred by the LTTE for over 30 years, history will not forgive YOU! You the President pardoned Sea Tigress Murugesu Bahirathi on 13 March 2015 who slaughtered many a true civilian just because she wanted to kill; she wanted to ethnically cleanse Sri Lanka to create a Tamil only State! Mr President, please show that you care and that you REMEMBER! You need to win the hearts of your citizens as a President- not those of the LTTE rump, the NGOs or the foreign Governments! Show your understanding and magnanimity to your citizens by granting a pardon to Sunil Ratnayaka.